It is widely accepted that the quadruplex, representing a supramolecular self–aggregate of guanine (G) containing recurrent units of four noncovalent interacting nucleobases (NBs) and one monovalent cation in DNA and RNA, has been associated with genome instability, transcription and replication of living cells. This line of inquiry has also evidenced experimentally associates such as quartets of uracil (U), adenine (A) and thymine as well as a tetramer, consisting of guanine:cytosine (G:C:G:C) NBs, respectively. In (C)–rich DNA sequences, a tetraplex of stacked hemi–protonated (C):(C) pairs (‘i–motif’) has been involved in regulatory gene expression. The supramolecular self–aggregates are promising drug targets implicated in cancer and other diseases. 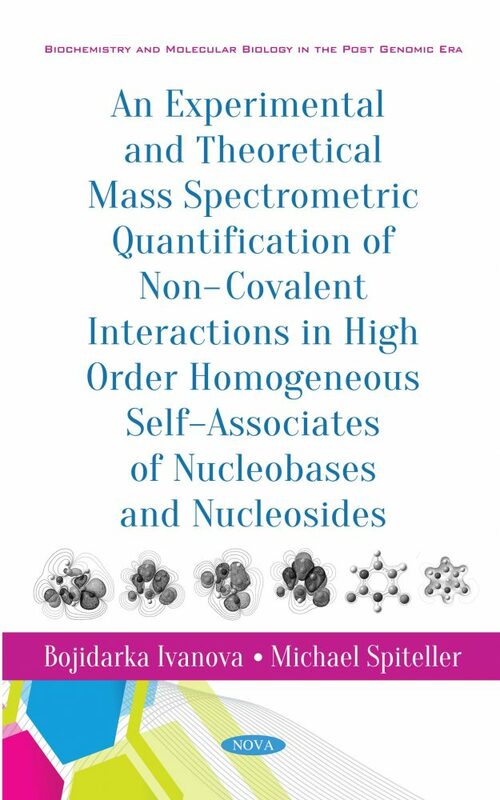 However, the authors argue in this chapter that there is still much research required in order to understand fundamental molecular forces and factors, determining the binding affinity and thermodynamic stability of non-covalent interacting NBs both in vitro and in vivo. Arguably, no less than an elucidation will allow us to shed light on molecular level mechanisms governing the supramolecular self–aggregation. To examine these issues, the authors perform mass spectrometric (MS) quantification of molecular noncovalent interactions of NBs and nucleosides (NSs) uridine (1), cytidine (2), guanosine (3) and N,N–dimethyl guanosine (4), respectively. They survey several methods concerning the study such as ultra-high resolution electrospray ionization (ESI), atmospheric pressure chemical ionization (APCI) and matrix assisted laser desorption–ionization (MALDI) methods in a single operation mode, coupled with collision induced dissociation (CID) mass spectrometry. The theoretical treatment includes high accuracy static and molecular dynamic (MD) quantum chemistry. Ab initio methods and density functional theory (DFT) are used. Stochastic dynamics based on the Box–Müller (BM) method is adopted determining experimental diffusion parameters of MS ions of non-covalent interacting species. They are correlated with experimental diffusion data using the “current monitoring method” and theoretical parameters obtained from Arrhenius’s formalism. There are two foci for this study. The first issue is which equation models connect experimental kinetic, thermodynamic and diffusion parameters with theoretical quantum chemical data about 3D structures of analytes? The second issue deals with the statistical claim that the presented models use their own experimental and theoretical MS results. Chemometrics, in order to be confident that there is a real functional relationship of experiment and theory, is used. In this context, the great importance of this complex analysis for the development of the “structural analytical chemistry” is undeniable.